Elegant details abound in this French influenced one-story home plan with arched windows, round columns, and rich brick veneer. An arched clerestory window in the foyer introduces natural light to a large great room with cathedral ceiling and built-in cabinets. The great room adjoins a skylit sun room with wet bar which then opens onto a spacious deck. 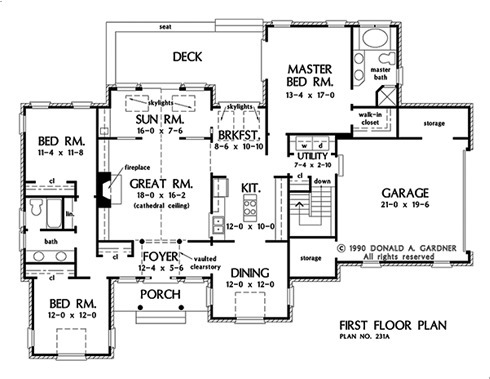 In this floor plan, the kitchen with cooking island is centrally located with easy access to a large pantry and utility room. 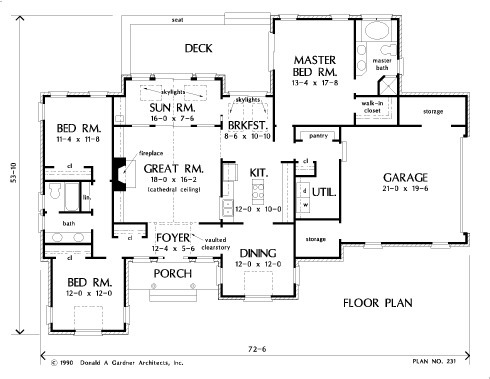 The large master bedroom opens to the deck and features a garden tub, separate shower, and dual sink vanity. 1st Floor: 2045 Sq. Ft.
House Dimensions: 72' 6" x 53' 10"
Great Room: 18' 0" x 16' 2"
Deck / Patio : 25' 2" x 10' 0" x 0' 0"
Storage (Other) : 11' 2" x 4' 8" x 0' 0"
Other (Cathedral): 16' 0" x 7' 6" x 14' 6"
Foyer (Vaulted): 12' 4" x 5' 6" x 17' 5"
Dining Room (Vaulted): 12' 0" x 12' 0" x 9' 8"
Great Room (Cathedral): 18' 0" x 16' 2" x 14' 6"
Breakfast Room : 8' 6" x 10' 10" x 8' 0"
Utility Room : 7' 4" x 7' 0" x 8' 0"
Garage : 21' 0" x 19' 6" x 0' 0"
Garage Storage : 7' 4" x 6' 2" x 0' 0"
Bedroom #1 (Vaulted): 12' 0" x 12' 0" x 9' 8"
Porch - Front : 15' 2" x 4' 9" x 0' 0"